It took me some time to review this series but here I am. Finally. I wanted to wait to finish reading the sequel and make a post about my experience. I had no idea what’s the book about when I first pick it up. When I discovered it was about a dystopia-illness-ravaging-the-earth kind of story, I rolled my eyes. Here we go again. I guess I’ve read too many YA novels with that theme, it just doesn’t excite me anymore. (C) I love this pic from Ashley @ NozeGraze, check out her review too! However, what may sound cliché in the beginning turns out to be something else entirely. It has one of the most intricate world building and detailed scientific explanations in the history of YA genre. This is something I enjoyed quite a lot, the nerd in me was satisfied haha. Fair warning : I noticed on other reviews that if you’re not fond of heavy science facts it may be a turn off for you. You’ll find gene splicing, the dark side of science and technology, the violation of freedom and what does it mean for humanity. The only downsides are the characters and some plot holes here and there. I’m not a fan of the heavy romance but hey, maybe that’s just too much for my taste and you may enjoy it. I know some people may not even start this series so there’s no point in spoiling the plot for the sequel. But if I might add, what lacks in the first book was compensated in this one. Rare are the sequels not suffering from the crappy sequel syndrome and this one is one of them. Hell, it’s even better than the first book. Action-packed, fast paced and A LOT of twists and turns are happening. For those who hesitated to continue with the second novel, I can say that This Cruel Design confirms Mortal Coil as a series worth continuing. Thank you to Simon and Schuster Canada for the copy of This Cruel Design ! Next Post Next post: What Makes a Good Book-to-Film Adaptation? Great review! I recently read this series too and I loved them! Glad you won this “lottery”…. This is the third or fourth time I’ve heard about this book — guess I’ll finally have to read it. Thanks, and great pic, too — I never knew about the art on the actual pages! A YA dystopia that isn’t terrible? I need it. I’m really glad you enjoyed this series Trang. 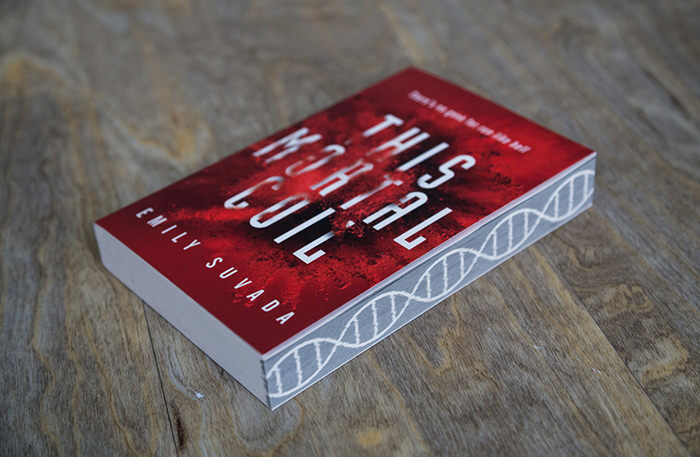 I haven’t heard too much about The Mortal Coil but your review has made me curious enough to add it to my TBR list, granted I’m not usually a fan of heavy science facts in books but I think if I’m aware of them going in I may still be able to enjoy the story. Lol. You had mr laughing about the nerd in you being happy. Gorgeous covers too! Despite your wonderful review, Trang, I am with you on cue the eyeroll for another epidemic YA dystopian tale. Because of this, I won’t be picking up this duology. I just… I am indifferent to these tales now. Perhaps it’s burnout? Who knows. But those books are GORGEOUS. Cool that this had such intricate world building. And amazing that the sequel was even better and that this makes up for what’s missing in the first one. Definitely want to check this out! Brilliant review!